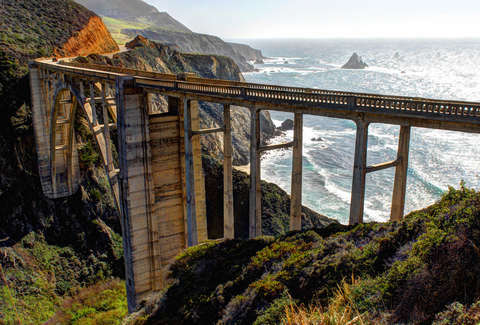 The Pacific Coast Highway, also known as California State Route 1 or Highway 1, runs for almost 550 miles along the California coastline and is probably (OK, definitely) the most beautiful road trip opportunity in the US. There are non-stop ocean views, jagged coastlines, stunning bluffs, tons of wildlife... and you never know what you’re going to find around the next corner or in the next small town. We started in the north, since driving north to south is the way to do it: that way, you’ll be on the ocean side of the road the entire time. Ideal for vista-seekers, not so hot if you're scared of heights? Whether it’s the first or last stop on the road trip, a photo of your car in the opening of the Chandelier Drive-Thru Tree is a must. 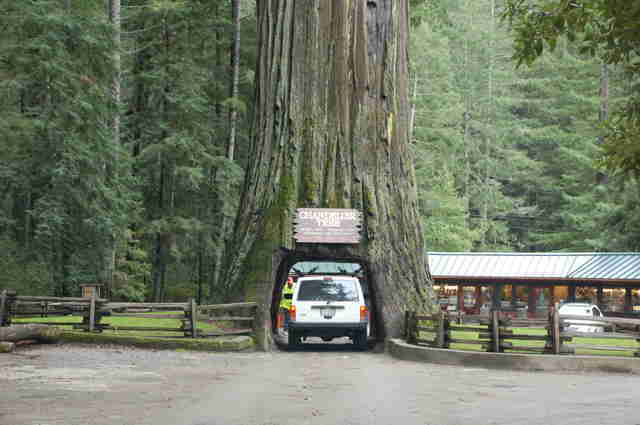 It won’t be the most breathtaking stop on the journey, but it’s one you can’t skip, as Leggett is where Highway 1 comes to its northern terminus... and because it’s a tree with an opening that’s big enough for cars to drive through. This old train trestle from 1916 used to play an important part in transporting timber to Fort Bragg’s mill, but now it’s a giant pedestrian bridge that goes from Fort Bragg to Ten Mile River. To get there, you’ll park right by Glass Beach, which is another must-see on the list. Convenient! Even when it’s shrouded in fog, this 115ft lighthouse tower is worth a visit, and, yes, it’s imperative that you climb the whole way -- 145 steps up the spiral staircase with four landings -- to get to the top. Because only then can you say you’ve been at the top of the tallest lighthouse on the West Coast. And only then will you be able to appreciate the 360-degree views. Sonoma Coast State Park spans 17 miles along Highway 1 and has more than a dozen access points leading to beaches, bluffs, and headlands. Frankly, they’re all stunning. 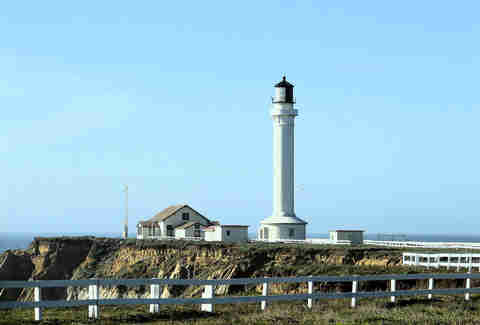 But Bodega Head made this list because the high cliffs over the ocean are the perfect place to spot migrating gray whales. 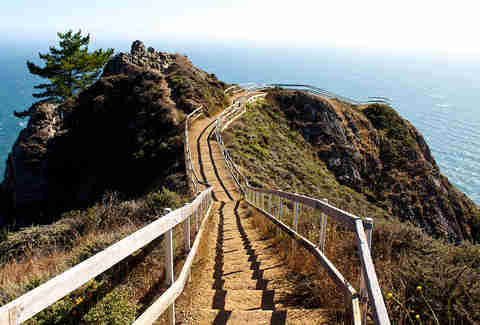 It only takes a few minutes to walk down the stairs to this overlook platform, which makes it even more of a must-do/must-Instagram for anyone road-tripping on Highway 1. 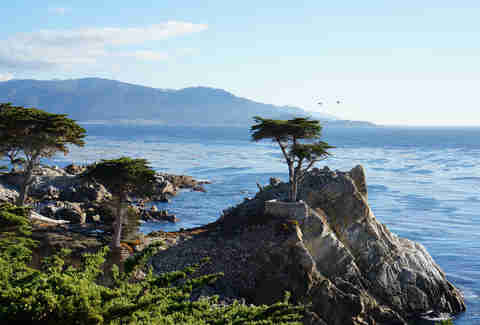 The Lone Cypress, which is pretty much what it sounds like, except even cooler because it’s been hanging out on its rocky perch for over 250 years and is one of the most photographed trees in all of North America. The Fanshell Overlook where you can spot harbor seals pupping from April to June, but is stunning year-round. China Rock is where Chinese fishermen made their homes in the late 1800s. Carmel is one of those quaint villages with colorful fairytale cottages, dog-friendly beaches, and such stunning natural beauty that it almost feels like the impeccably clean town is straight out of a movie set. 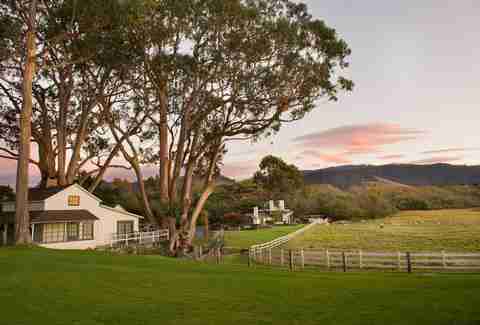 Spend a day there wandering the beaches, touring the Carmel Mission, and eating dinner at Mission Ranch. Point Lobos is known for its beautiful views of the Pacific Ocean and surrounding forest. 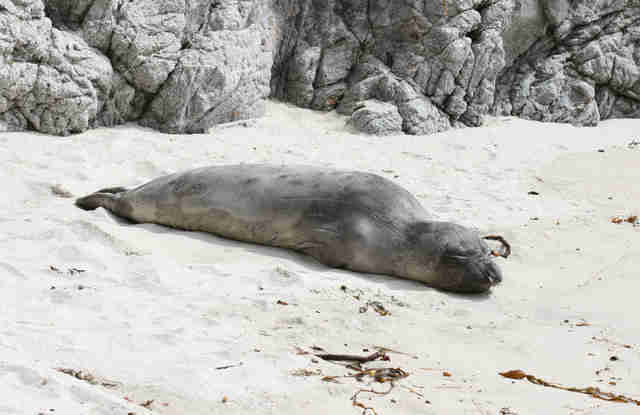 There are tons of coves, and an abundance of marine mammals, including sea lions, whales, sea otters, and harbor seals. This place is so gorgeous, it's been called the “crown jewel” of the California State Park system. If you only have time to explore one part, check out Whalers Cove. It's a good spot to check out some sea otters (and the historic cabin is worth a peek, too -- they used whale vertebrae in the foundation). Bixby Bridge is one of the tallest single-span concrete bridges in the world and is one of the most photographed bridges on the Pacific Coast, right after that other famous bridge... you know, the one that spans the Golden Gate. It’s more than 260ft high and 700ft long, and definitely worth pulling the car over to take pics. If you’re driving up or down the PCH, you’ve got to eat somewhere and, when you’re in Big Sur, that somewhere should for sure be Nepenthe. Grab a seat on the deck that feels like it’s growing right out of the cliffside, and hang with the locals (and the other tourists) while taking in some of the most amazing views you’ll ever experience at a restaurant. 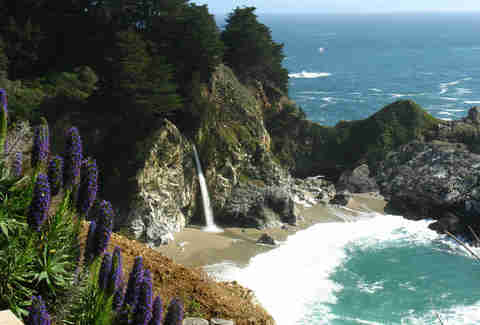 McWay Falls in Julia Pfeiffer Burns State Park is an 80ft waterfall that drops from the cliffs and into the Pacific Ocean. It’s also one of just two tide falls in California, and if you’re only going to see one, it’s the one to see. If you’re there in December, January, March, or April, it’s also a great spot to hang out and watch for gray whales migrating to or from their breeding grounds off of the Baja California coast. It’s definitely worth setting aside time to spend the day exploring this grand estate formerly owned by William Randolph Hearst. The mansion has 165 (no, seriously) rooms full of Hearst’s personal art collection, and, just in case that isn’t enough, there are also 127 acres of gardens, terraces, and pools with gorgeous views of the ocean. Yes, it’s totally touristy, but there’s a reason why. Just be sure to buy your tickets ahead of times as tours do sell out, especially in the summer. The best times to visit this rookery that more than 17,000 elephant seals call home are in late January, late April, and late October, but even if there aren’t any elephant seals lumbering about on the sand, it’s still a gorgeous place to stop and take in the view of the ocean and the nearby Piedras Blancas Light Station. 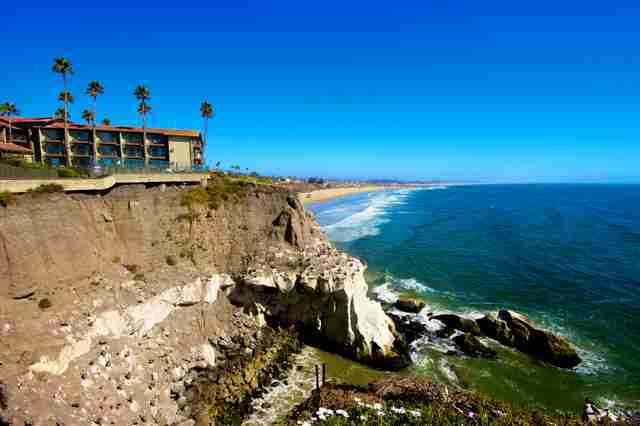 When you think of Pismo Beach, you probably think of Cher in the movie Clueless telling her father she was Captain of the Pismo Beach disaster relief. And if you don’t, then you clearly haven’t seen Clueless enough. Anyway, the good news is that there never was a Pismo Beach disaster and the classic beach town’s long white beaches are still intact and the perfect place to enjoy a sunset. Just a little off of Highway 1, you'll find Mission Santa Barbara, termed the “Queen of the Missions for its graceful beauty.” Founded in 1786, the church still has an active parish and is home to a community of Franciscan friars. In addition to the church, there’s a cemetery and mausoleum, as well as 12 acres of landscaped gardens to explore. 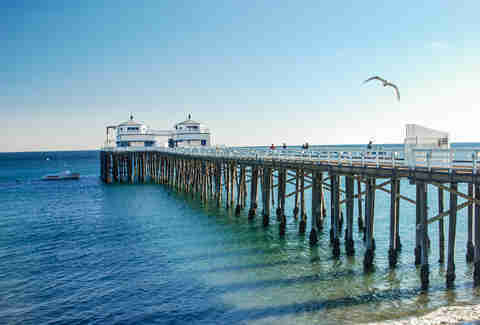 Malibu is located along 21 miles of prime Pacific coastline. The only problem is that there are tons of private residences along the PCH, which makes accessing the views and beaches difficult. Head to the Malibu Pier, where you’ll be able to take in great views of the Pacific, and if you turn around, you'll also get views of all the spectacular homes. If it’s in the budget, eat an early dinner at Mastro’s Ocean Club, which is definitely worth the price -- especially if you can get a seat by the window during sunset. Between Corona del Mar and Laguna Beach is Crystal Cove State Park, which has 2.3 miles of sandy beaches, coves, and tide pools... and, of course, amazing views everywhere you look. It is part of the California coast, after all. Daisy Barringer is a freelance writer in San Francisco who loves nothing more than a good road trip. Tell her your favorite stops on the PCH on Twitter @daisy.